Do you want to promote your products abroad? Looking for partners to get your promotion activities off the ground? Find all you need to apply for co-funding to promote your agri-food products. Learn more about available funding, eligibility criteria and application procedures. Information on markets, exporting procedures, intellectual property rights and more. Search for relevant partner organisations to submit a joint application for funding. 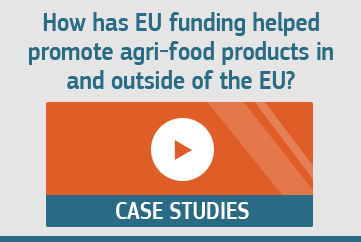 Find an EU co-funded campaign relevant to your product sector or country of interest. Help us improve this portal. We appreciate your opinion! Were you able to find relevant information while browsing the website? Which parts of the website are most useful for you? What additional information would you like to find on the portal? Do you have any other comments or suggestions on this portal?